Microbes (including bacteria, viruses, fungi, and protists) are ubiquitous on earth and affect every part of our lives. Yet they are mostly invisible, and the vast majority of microbes are still unknown to us. 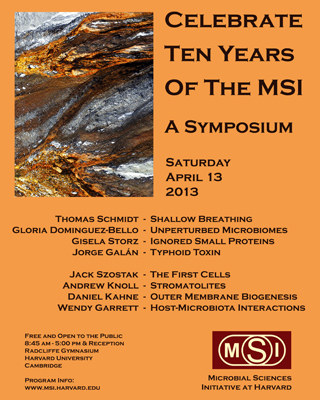 On Saturday, April 13th, eight prominent microbial scientists hailing from a wide variety of disciplines will share their investigations into these enigmatic microbes during the Tenth Annual Microbial Sciences Symposium. This all-day event, which is free and open to the public, is hosted by the Harvard MSI and will be held in the Radcliffe Gymnasium at the Radcliffe Institute for Advanced Studies on the Cambridge campus. The MSI at Harvard is an interdisciplinary program (spanning the fields of molecular biology, engineering, physics, evolutionary biology, genetics, environmental microbiology and microbial ecology) focused on understanding the microbial world. Co-directed by Colleen Cavanaugh (OEB) and Roberto Kolter (Microbiology and Immunobiology, HMS), the MSI links researchers in FAS, SEAS, HMS, HSDM, and HSPH. The Microbial Sciences Symposium is the largest and most visible event that MSI sponsors, and its aim is to stimulate discussion among members of the scientific community and help strengthen integrative science programs. Symposium topics reflect the enormous value MSI places on interdisciplinary research. At this year’s event Harvard’s own Jack Szostak will discuss the origin of cellular life and the emergence of Darwinian evolution. Maria Gloria Dominguez-Bello, a faculty member of the New York University School of Medicine, will provide an anthropological prospective on microbiota. From Harvard’s School of Public Health, Wendy Garrett will talk about how the microbiota influences one’s health/disease state. Jorge Galán (Yale University School of Medicine) will take a look at the unique biology of Salmonella typhi. One of MSI’s original faculty members, Andy Knoll, will reveal the history of life written in stone by stromatolites. Tom Schmidt, who recently joined that faculty at the University of Michigan, will discuss the microbial ecology of low oxygen environments. Harvard’s Dan Kahne will talk about his research on the biogenesis of the cell envelope. The regulatory role at the membrane by previously ignored small proteins will be presented by Gisela Storz from the National Institutes of Health. The MSI Symposium begins on April 13th at 8:30 am with a light breakfast followed by the lecture series. The audience is free to explore the Harvard Square area for lunch from 12:00 until 2:00 pm. At 5:00 pm the MSI is hosting a catered reception for symposium speakers and participants.